Sometimes you work on a project and you think wow thats pretty awesome. 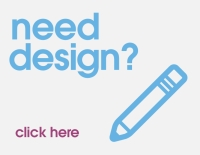 This is happening to me more often than not recently and itâ€™s a great testament to the amazing work our designers and those we work with closely throughout Belfast. 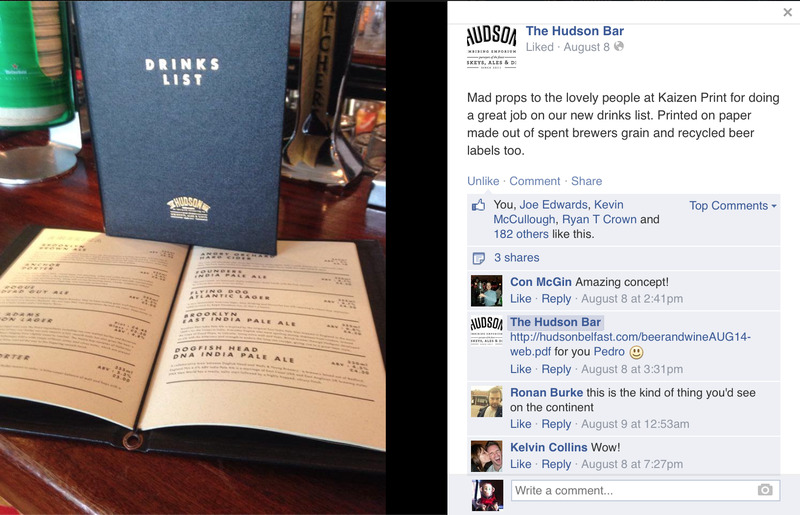 Todays blog post is from a bar I frequent from time to time, the Hudson and their amazing drinks list. Located in Gresham street, which is famous for its variety of adult shops, the Hudson bar has really took the area to a different level and invigorated life into a lesser travelled part of town. Its a heady mix of traditional Irish bar, coupled with new age hipster styling. Did I really just type that? Look, itâ€™s a really nice place to sit and eat some of their delightful chicken wings or indulge in a beer or two. Iâ€™ve worked with Michael Murray, the man behind the Hudson brand for countless years on everything from posters, programmes, flyer and now of course the Hudson's soon to be iconic drinks lists. And what a beauty they areâ€¦. Starting from the outside, we created an extremely durable hard back, covered in a black cloth and tooled with gold foil blocking. The level of detail retained in the Hudson logo even at this small size is outstanding and definitely a work of art from our finishing departments fair hands. Inside is where everything goes super special. The bar wanted something different, something nobody else would have and wanted to get creative. 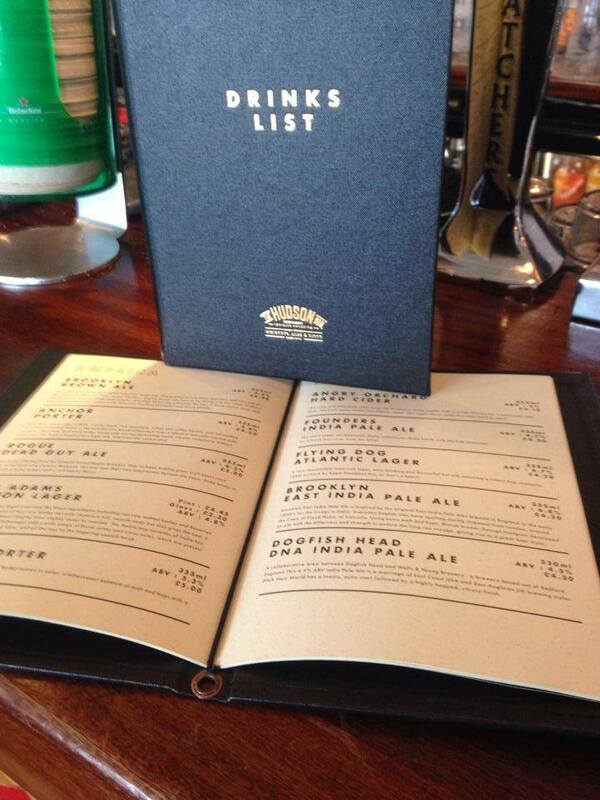 Firstly the design of the drinks menu is outstanding and a testament to Michael Murray's work for the bar, but what if we told you the paper it was printed on was made from spent brewers gain and recycled beer labelsâ€¦Mind = blown! The bespoke GF Smith Paper is called Bier Garamund Lager and is a work of art in its own right. With a distinct yellow tinge and flecks of colour throughout it adds an extra dimension to the already magnificent project. Showcasing beers and wines from across the world, the drinks menu from the Hudson is one of the best I have ever seen and I do make a point of looking at all in every restaurant / bar I visit. I think their own patrons like the project too. Over 182 likes, 3 shares and a huge discussion about them in the bar itself can ultimately tell us that they have been extremely well received. If you have a bespoke project like this that you want to talk through or bring to life, weâ€™d love you to call us on 028 9002 2474.